Feds Unlikely To Prosecute Zimmerman, Former Prosecutors Say : The Two-Way After seeing a Florida jury acquit George Zimmerman of the charges against him for the death of Trayvon Martin, those who have handled such cases on the federal level say they have doubts about the likelihood of a hate crimes prosecution being made. -- No Federal Case? "Former federal prosecutors are telling me that they don't expect a federal criminal prosecution" of Zimmerman, NPR's Carrie Johnson said on All Things Considered. She noted that the federal jurisdiction "is very limited," and that prosecutors would have to make the case that Zimmerman was driven by "some kind of racial motivation ... racial animosity." The burden of proof in such a hate crime case, Carrie added, is much higher than the burden in a manslaughter prosecution — the lesser of the two charges that prosecutors asked the Zimmerman jury to weigh. Still, the Justice Department has said it continues to look at the case. 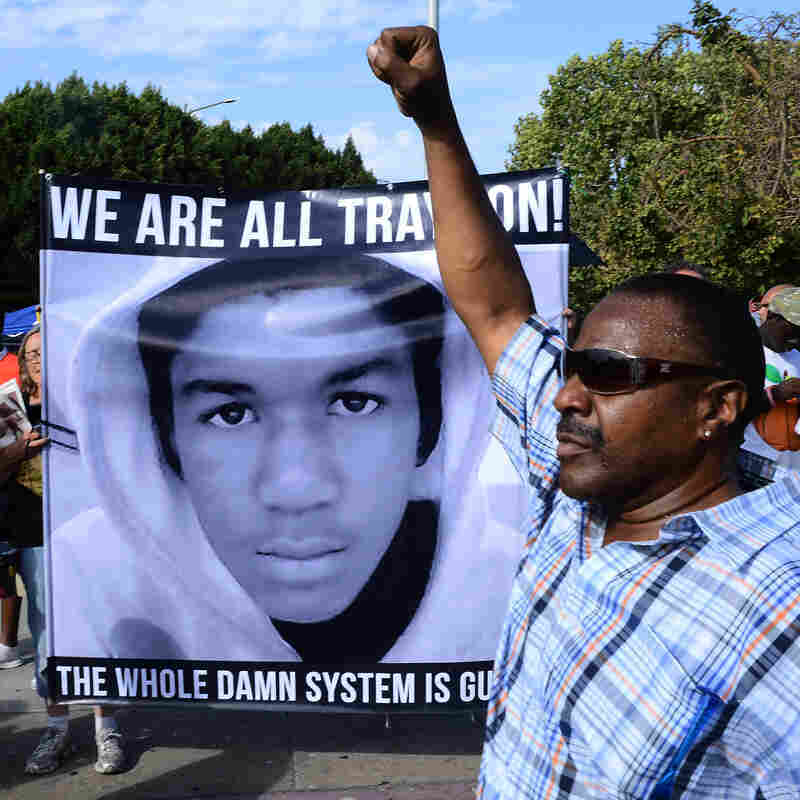 In Los Angeles on Sunday, demonstrators expressed their anger over the acquittal of George Zimmerman on the charges he faced for the death of Trayvon Martin. "Barbara Arnwine, president and executive director the Lawyers' Committee for Civil Rights Under Law, said in a news conference at the Orange County Courthouse that she has been in frequent contact with federal justice officials and is confident they have been building a case that could lead either to a civil rights violation charge or a hate crime charge against Zimmerman. The two charges come from different laws. "Nationally, a petition drive launched by the NAACP has garnered hundreds of thousands of signatures in the first couple of days, urging the Department of Justice bring such charges Zimmerman." -- Don't Move The Goal Posts, Zimmerman's Brother Counters. Before his brother was charged following Trayvon's February 2012 death, those who wanted George Zimmerman taken into custody said, "we just want an arrest, we just want simple justice," Robert Zimmerman said Monday on Tell Me More. "Then there was an arrest after much clamor. And then the rallying cry was, 'well we just want him to have his fair day in court, that's all this was ever about; his fair day in court and let the jury decide.' And then he had his day in court." Now, Robert Zimmerman said, "the jury's made a decision and the goal posts are moving again. I don't understand what people want or how much more they want to trash my brother for something that is a very straight forward act of self-defense."